There is no doubt that business processes have undergone a radical change. Because it’s so easy and efficient to store and manage data in digital format, extremely important records, business contacts, archival records, proposals and financial data reside on computer systems. As early as 2002, International Data Corporation (IDC) projected a dizzying annual data growth rate of 80%. Today, the business that is not utilizing computer technologies will be left behind as digital technologies dominate how business gets done. Accompanying this revolution is a new concern. With business and individuals maintaining so much data digitally, data loss due to a hard drive crash or some other disaster is a financial risk. Without secure data backup a business may face costly computer disaster recovery costs and, in the worst case, completely lost data. With the exponential growth of online business activity, smart companies are choosing to secure their data with secure remote backup. With offsite backup, businesses never have to fear catastrophic data loss or an interruption of business continuity. At Konicom, our Sacramento remote data backup center offers the best in field tested online backup. It is estimated that 1MB of data is valued at $10,000 or more.1. Repairing 20MB of lost data may take three weeks and cost as much as $17,000.2. A leaked record can cost $180 and more to rectify3. Data loss costs businesses in the U.S. more than $18 billion a year according to study by a researcher for Pepperdine University4. About 60% of people lose data because of viruses, a hard drive crash, accidental deletion or system failures. 40% of “computer savvy” people lost data at least two times a year. A Symantec study shows that 90% of users store important personal information on their computers but only 57% backup their data and less than 5% have offsite backup. A 2005 global survey found that most employees try to do data recovery themselves using retail data recovery software. This, according to the study, often fails and results in permanent loss of the data. After a computer hard drive crash followed by failed attempts at in-house data recovery, it costs an extra $1000 and three to five days of downtime for professional data recovery. 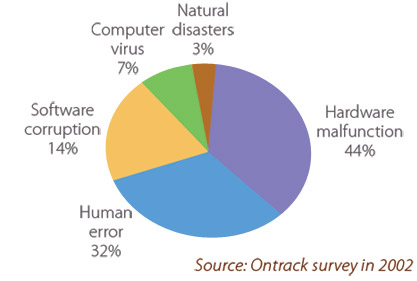 A 2002 survey indicates that 76% of data was lost due to a hardware malfunction or human error. Methods for data backup and storage using devices like CD-ROMs, external hard drives, flash memory and other ‘quick fixes’ that were conventional in the past are no longer adequate for today’s needs for securing digital data. Our Sacramento remote data backup center takes data security to new levels that address the demands of today’s business climate. With offsite backup there is never a question about the security of your data or about your access to it when and where you need it. Secure offsite backup is insurance that can keep your business up and running. Now, you can have the comfort of knowing that your remote backup is entirely secure with our encrypted system, and always available to you – and no one else. Working with small businesses, Konicom knows how costly data loss can be – both in time and in business interruption. That’s why we are pleased to offer our remote data backup program. With offsite backup, you’ll have the confidence of knowing your valuable data is protected, secure and right at your fingertips.